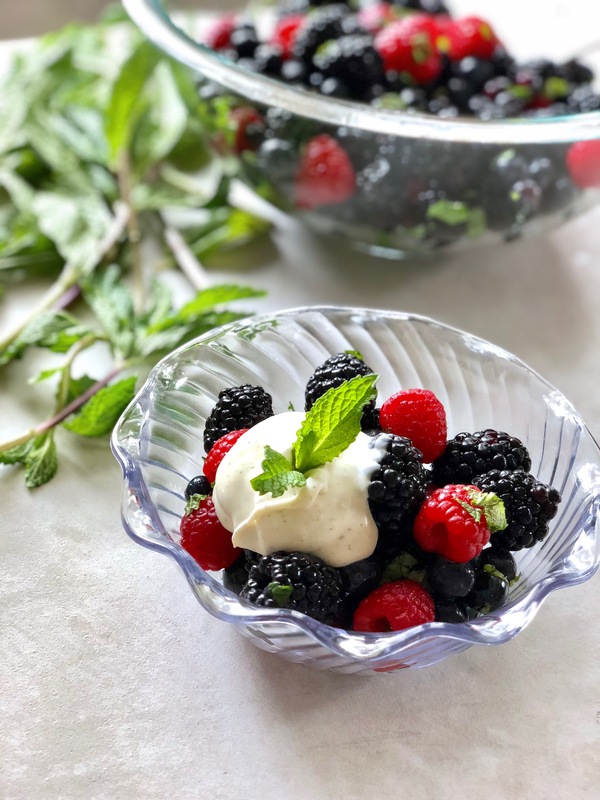 This refreshing mint berry bowl is the perfect treat to keep you from feeling weighed down during the dog days of summer. 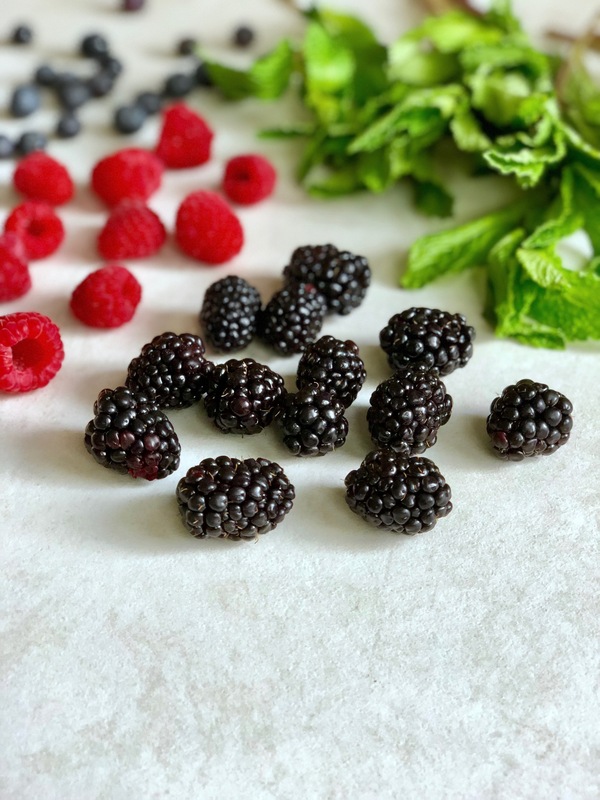 Packed with nutrients, these berries are also an easy dish to throw together and take to anyone who needs a little nourishing snack! It was January and happened to be extremely cold in the days following Noah’s arrival. A dear friend of mine stopped by and didn’t want to bother us. Looking back, I thank her so much for this because not only was I experiencing new levels of exhaustion, but my eyes kept pouring out tears for no apparent reason. I was, in short, a giant leaking mess. Since it was so cold out, she left a beautful mint berry bowl outside our door with this incredible vanilla sugar topping. This became my first postpartum craving. We finished off the bowl pretty fast, so the next few trips to the store included stocking up on similar berries and trying to ration what was left of the sugar topping to make it last longer. These berries were heaven on earth for this new mama. I am sure that my body was craving nutrients as my milk had started to come in, and fresh fruit was just the answer it needed at that moment. This simple kind gesture will always be remembered with such a thankful heart. Because a) we eventually DID eat all the sugar topping and b) I love it so much, I have since created my own version in this Summer Mint Berry Bowl. Every time I make it, my day gets brighter and the stress around me doesn’t seem quite so heavy. I topped mine off with a little vanilla bean creme fraiche for a fun twist that makes a perfect little 5 minute, low-calorie dessert. 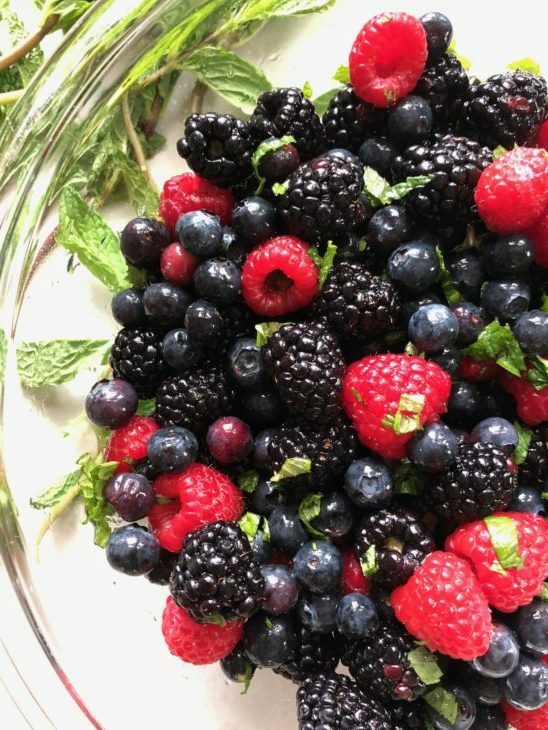 WHAT IS SO GREAT ABOUT MINT AND BERRIES IN THE SUMMER? The great thing about berries is they are available year round. However, they have the best flavor throughout the summer months, which is great because mint is also growing in abundance. In fact, I am usually trying to pawn mint off on people by September because it is trying to take over my front porch rocking chairs as the vines stretch out way past their designated flower box. 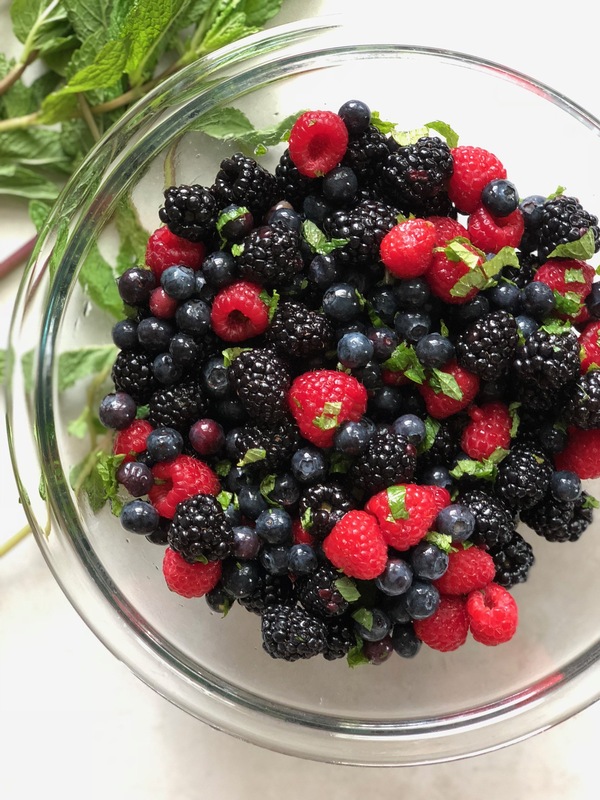 Berries are abundant in fiber, manganese, copper, folate, as well as vitamins C and K. They are also loaded with antioxidants which help to reduce inflammation in the body. That explains my cravings! To learn more about the benefits of berries, click HERE. I LOVE 5 minute, low-calorie desserts – and I have created other delicious options like this BANANAS FOSTER A LA MODE. They help stave off dessert binges while satisfying those sugar cravings. What kind of desserts do you crave? Tell me in the comments and maybe we can turn it into a healthy version for you! The perfect blend of summer berries coated in a light vanilla mint topping. Full of nutrients and flavor! Makes the perfect gift for new moms too! With the back of a spoon or muddling utensil, mix sugar, mint and vanilla together until blended well. Add rinsed berries and gently mix well. Serve cold topped with creme fraiche. Add a dollop of yogurt or creme fraiche for a fun twist!